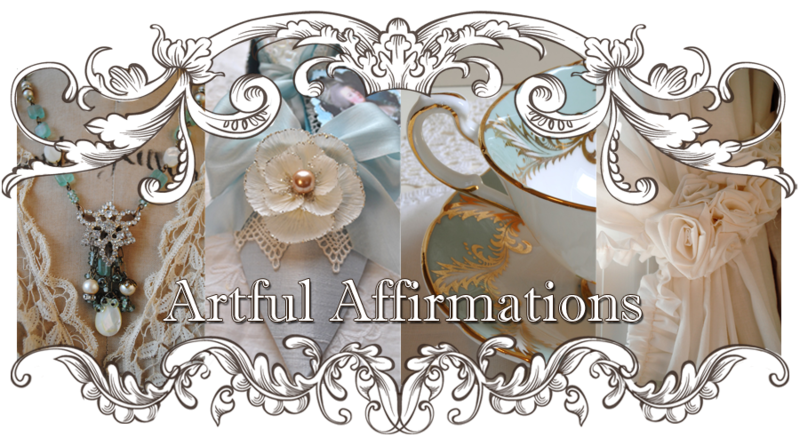 Artful Affirmations: Tea Cup Tuesday-Johnson Bros.
Time again for Tea Cup Tuesday! I was lucky and did find a few new cups on my trip! Found in a Salvation Army shop in Newmarket, Ontario. I have always loved thistles. They are so beautiful. There were quite a few, and I chose a setting of four to take home with me. The coloring looks lovely in a holiday setting. The silver trim adds to the wintry feel. The oval shape of the plates is an extra treat for this set. I find this shape charming! 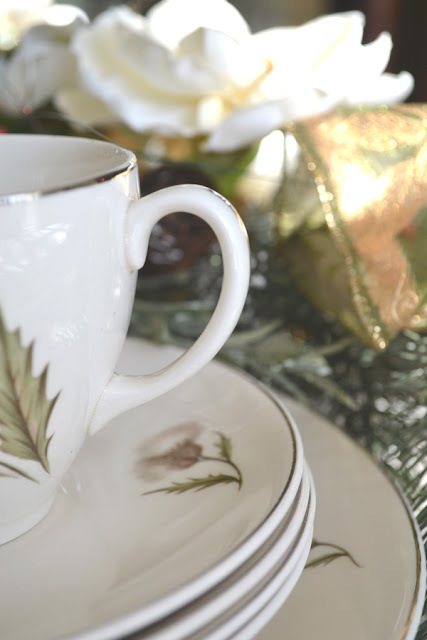 This pattern has a simple white handle, with just a touch of silver along the middle. 1 and S. Anyone out there specialize in Johnson Bros? If I had to guess, I would put them around 1940(ish). I am quite tickled to bring this set home from our travels! and for sharing tea with me! I am thrilled you were here! Would you like to join in and share a tea cup? Martha and I love to come and see your lovely china and tea. and will be taking another week off T.T. Sounds like we both traveled a fair distance during the holidays. Such fun spending time with loved ones! 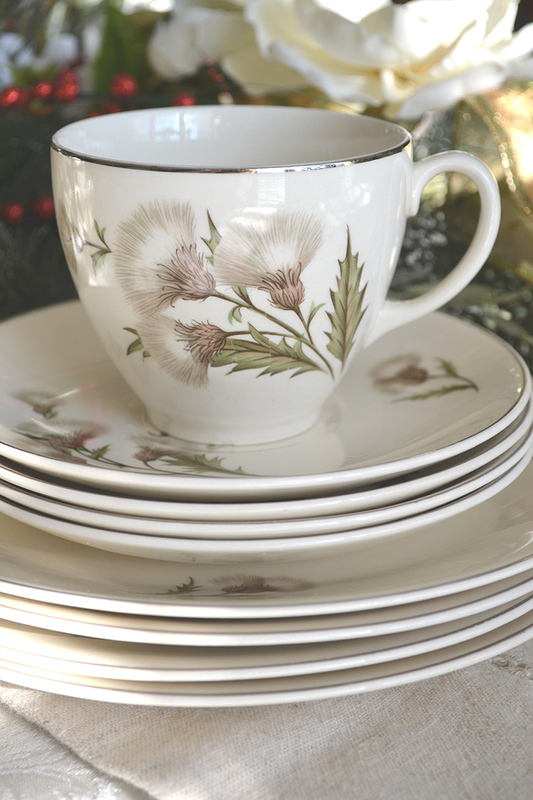 Your new china is very pretty and I like thistles myself. 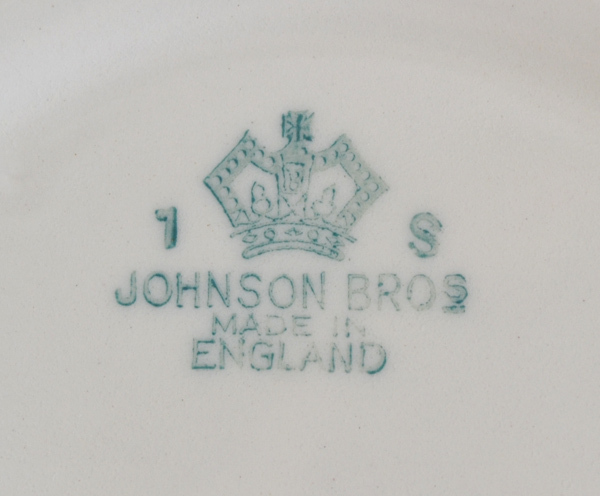 And it's Johnson Bros. too. 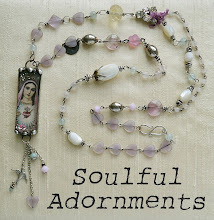 Thank you for another lovely post and for your visit. It's always a treat to have you stop by. Happy New Year! these are the reason i love Johnson Bros!! their designs are beautiful! you got quite a find!! 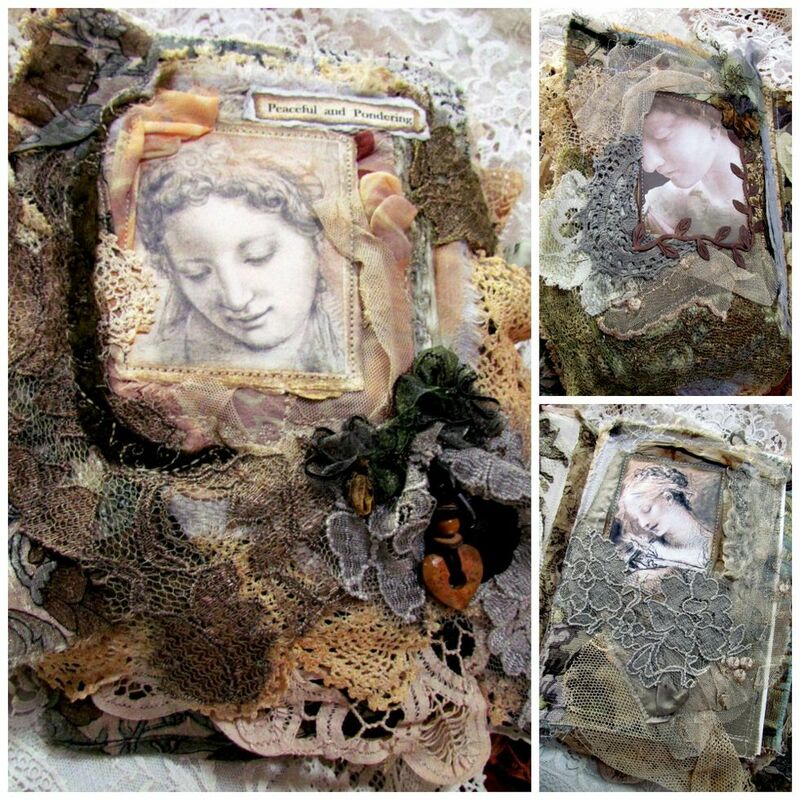 Another beauty Terri..I love how soft and subtle the colors are.. and almost monochromatic ..stunning and charming! Beautiful! happy tea..and thanks for your visit and kind words, so appreciated!! Hi Terri and Happy New Year! It is quiet this week...everyone still recovering! LOL! I haven't seen your pattern before. Very nice! I love thistles. 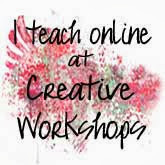 Thanks for hosting and linking to Tuesday Cuppa Tea! Terri I really love that set - and you are right, it is wintry looking, yet isn't, either - perfect colour combinations - it is a truly soothing colour scheme! Just beautiful!! Thanks so much for visiting and your nice comment that you left for me!! What a lovely tea set Terri! Sometimes the sweet simple designs are the best for enjoying a cup of fragrant tea! Have a happy, peaceful day! 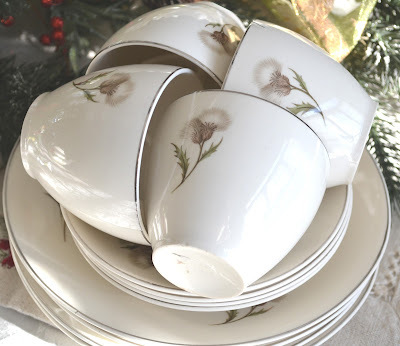 What a beautiful find in the Salvation Army store in spotting those thistle teacups. They would look so pretty in any setting. I would love to link up, Terri! What a beautiful pattern in JB. I always love JB no matter what the pattern. Happy New Year! 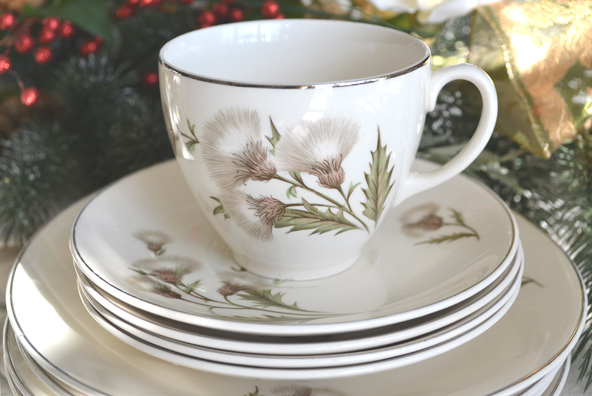 I love your gorgeous thistle teaset by Johnson Brothers. The thistle is found in so many locations and they differ so much from short to tall plants. 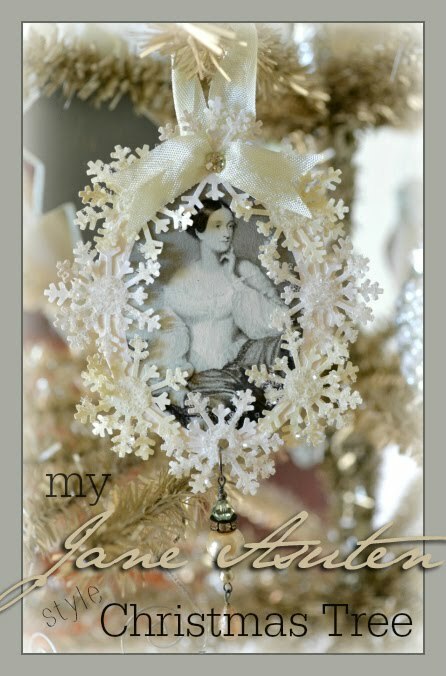 I like the idea of an oval shape and makes this set lovely and unusual. Happy New Year to You and Your Fammily! New cups of beauty, in your position,dear Terri-and so elegant and lovely, with their pale pattern and the silvery lining. Your cup of tea shared, I`m sure tasted very special and great,too! So delicate and completely gorgeous! I love JBro's china, I love your find! The best time is when we spend it with our dear family. Thank you for sharing and for the tea party. Big hugs and have a happy week. 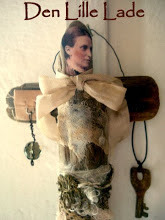 so sorry to read that Martha needs prayers. I will for sure pray for her. Thats not a nice start for her. Your new finds are wonderful. How outstanding is an oval shape and the thistles look really winterly and calm. I love china with silver trims, its so seldom. Thank you for sharing this wonderful set and for hosting this sweet event. What a lovely silver thistle pattern! It has such a soft and soothing look to it, which is not what usually comes to mind when thinking of thistles. 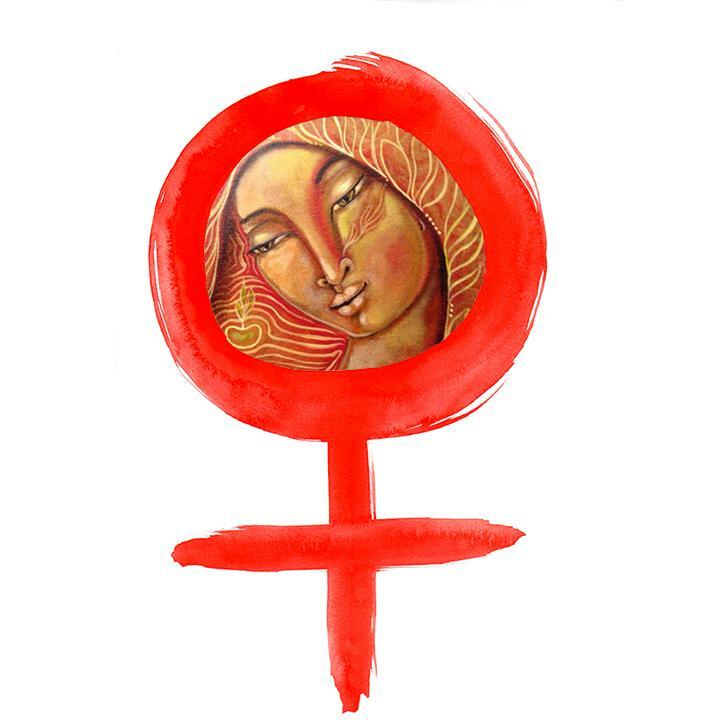 :-) Thank you for hosting this virtual tea party each week. 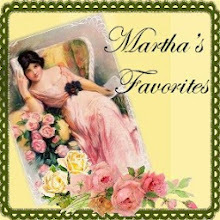 My prayers are with Martha and her family. 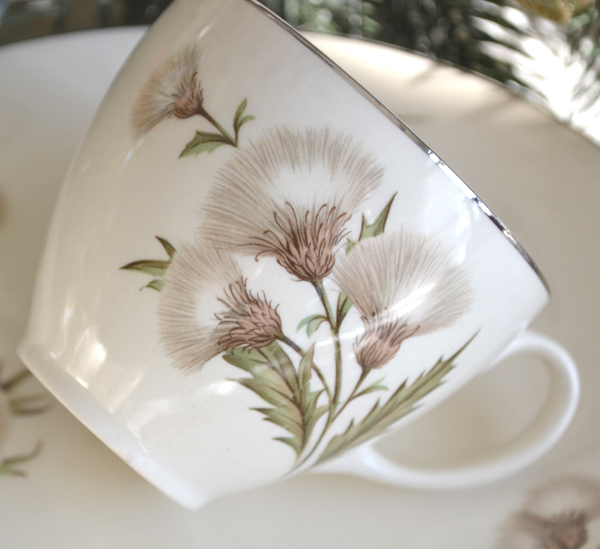 Love your new thistle teacups & saucers. What a fabulous find! Thanks for hosting. Wishing you all the best in 2013! So gorgeous Terri! I love thistles too! Did you know they are the flower of Scotland? 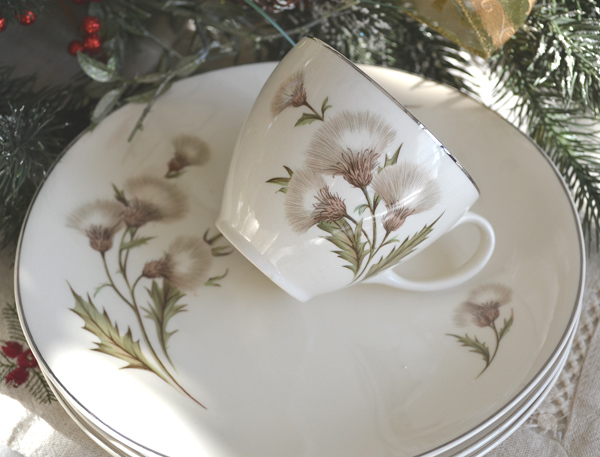 I love thistles and have Scotish roots so I am very jealous of your beautiful finds. Oh I just love the soft, neutrals....great find Terri! thanks for sharing..and for visiting. Hope you're having a wonderful year thus far. It's grand to share teatime once again.. Your Johnson Bros. sets are gorgeous ... The simplicity and balance of image and colour is very dreamy ... I too, love the Scottish thistle, and at first thought it was a dandelion with a fluffy seed head... either way I think it's a gorgeous addition to a your collection and a unique find.. Happy New Year.!!!! thank you for sharing a cup of tea with us! This is a very chique cup I think! Have a nice day!! 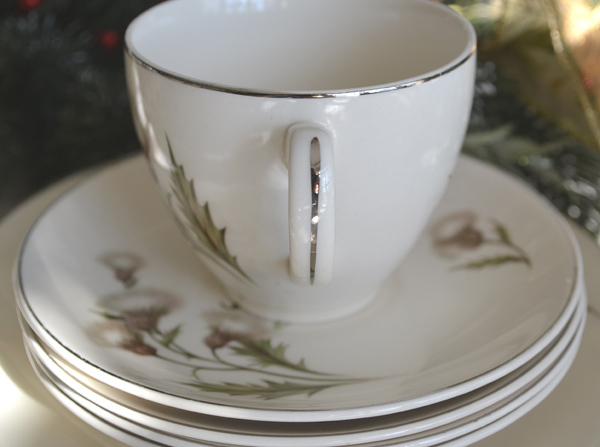 I like the silver trim on cups as it makes them look more elegant. The plant of your cup reminds me of make up brush--so soft and gentle. 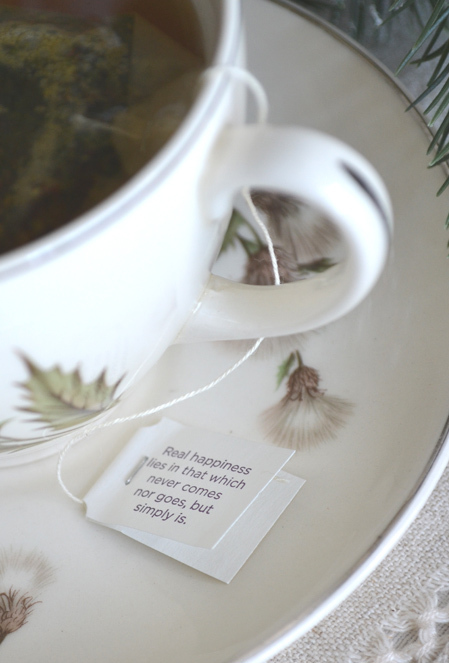 Love the motto on the tag of the tea bag. Yes, we always need to live in the NOW as past has gone and the future is not yet. Happiness is in the NOW. Hello Terri! Your new teacups are lovely, I like them a lot. I want to wish you a Happy New Year. 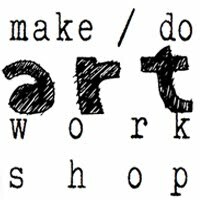 I have been a bit lazy with the blog lately because we are in summer vacations but I'll sure join your great party soon. I love your new china-great find!